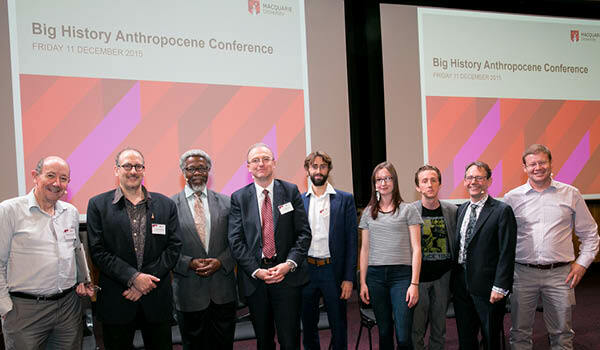 Setting the stage for Big History in 2016: Executive Director Andrew McKenna shares his highlights from the Big History Anthropocene conference. The Anthropocene is undoubtedly an era of challenge - we must urgently equip ourselves for a future that in so many ways is already here. It is also an era of opportunity - because our intellectual capacities will be drawn upon as never before. The Big History Anthropocene Conference in December coincided with the gathering of world leaders in Paris for COP21 and addressed the question of whether we have the knowledge, frameworks, and paradigms to chart our way through our own future. The conference was a tremendously successful exploration of the impact of humans on the biosphere and the challenges of the 21st century. The announcement of 10 PhD Cotutelle scholarships has set the stage for Big History in 2016 to advance the cause of innovative transdisciplinary research. Big History Institute scholars will be located in faculties across the university and will pursue their PhDs on a transdisciplinary theme arising from the conference in conjunction with Macquarie University partners around the world. Our experimental survey tool for conference attendees to record potential research concepts arising within and across conference sessions generated important insights and ideas - thank you to all our contributors! The quality of the presentations was superb - my thanks to all our academic participants, from across Macquarie, Australia, and the world! David Christian's opening keynote provided a wonderful framing for what was to follow, and it was great to see the program mesh so well across the three days. Identifying a few personal highlights is very difficult when I thoroughly enjoyed every session. However it is hard to forget Professor Sylvester James Gates taking us through the 12 'human extinctors' that occupy the attention of the US President's Council of Advisors, or Professor Peter Brown pondering whether economics is actually designed to operate on planet earth. Professor Lesley Hughes shared her hopes and expectations on COP ahead of the landmark agreement, and on Human Rights Day Dr Kirsten Davies reflected on Human Rights and Climate Change. I felt that Will Steffen delivered a profoundly impactful presentation on climate change - my immediate reaction was that everyone on the planet needs to have a chance to see that presentation. Thankfully we were filming. I was fascinated by Professor Jan Zalasiewicz presenting the evidence that we have indeed entered a new geological time period with new minerals, rocks, strata, and chemical signals - the image that we have produced enough concrete to make a full scale replica of the earth 2 mm thick will stay with me for a while yet. Professor Michael Gillings brilliantly connected humans to Anthropocene extinctions by exploring the plight of the human microbiota, whilst Professor Jeffrey Braithwaite has ensured I will never look at health systems the same way again. Dr David Grinspoon kicked off a more than slightly mind-expanding session on humanity's long term prospects which saw fantastic contributions including Macquarie Big History PhD candidate Elise Bohan exploring Humanity 2.0. And these brief notes are just a slither of the fantastic presentations delivered. We will be making links available to all the sessions, and exploring how we can disseminate the rich collection of presentations to a global audience. Stay tuned on Twitter and via Threshold 9 for more news on that. Finally, the interest and interaction from our diverse audience was extraordinary. I sincerely thank everyone involved - the atmosphere during the conference was inspiring, and the feedback we have received since has been incredibly positive and encouraging. Thank you again for your support and we look forward to working with you all in 2016!